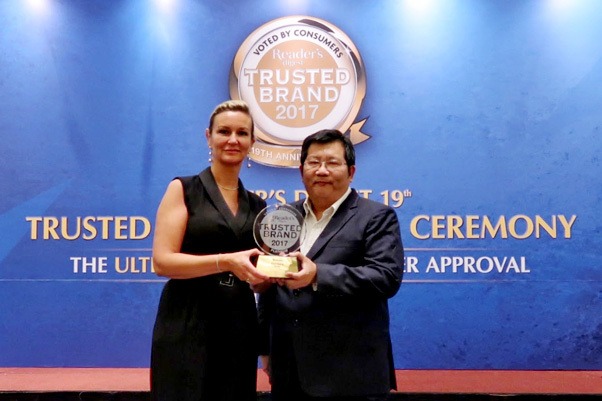 On 20 April 2017, Knife, Buruh & Naturel being the leading players, were awarded the prestigious Reader’s Digest Trusted Brands Award 2017 in the “Cooking Oil” category in Malaysia. Knife Cooking Oil emerges as the only platinum winner in the Cooking Oil category and has been announced for the 18th consecutive year winner for The Reader’s Digest Trusted Brands Awards. Naturel & Buruh has won the gold award and we are proud to announce that Naturel has won this award for the 2nd consecutive year while Buruh has won this award for 12 years consecutively since 2006. It is the consumer’s satisfaction with our products that makes our brand success. Mr Lo Wye Kan, Senior General Manager receiving the awards from the guest-of-honour Sheron White, Group Advertising Director of Reader’s Digest.